The GreenWorks 80V Blower has proven itself to be a wise investment with homeowners as it strikes a nice balance between power, price, quality and reliability. This truly is a powerful blower — the equivalent of a 32cc gas leaf blower. For most homeowners, this is more than enough to handle all of your yard cleaning needs. But, since we recognize that everyone has different needs, we also review several other battery-powered leaf blowers to give you range of options to consider.If the ground is covered in leaves every time you look outside it can be very depressing. You know you’ll eventually need to go out with your trusty rake to take care of business. Luckily this horrible feeling can disappear forever if you have the right tool. A power tool like the GreenWorks 80V blower will take care of all your problems. The hardest thing you’ll need to do is point and shoot. If you’re interested in buying a leaf blower you’ll be pleased to know they can do more than you think. Clearing Up Leaves From A Wooden Deck – If you drag a rake across wooden decks you’ll get the leaves, but it’s going to leave its mark. You don’t want to end up with scrapes all over your decking because it will lose its appeal. Working Along The Base Of Your Fence – You can get most of the leaves at the base of a fence, but there are too many gaps to get them all. It’s easy for the leaves to get stuck and only a strong blast of air will be able to get them out. Nooks And Crannies Outside Your Home – Most people will have lots of nooks and crannies around the exterior of their home. A rake will be too wide to squeeze into them. Leaf blowers will clear these areas and you won’t hurt your back picking them up. Anywhere There Are Rocks Lying Around – If you have dirt in your garden it will be full of rocks, which you won’t be able to rake around. You’ll end up with the same problem if you have flowers, but it’s worse as your rake might end up ruining them. Emptying Your Dirty Gutters – When it’s dry everyone should clean their gutters provided it’s safe to do so. You don’t want debris building up in case it stops water from draining away. When it freezes everything could come crashing down costing you lots of money. Drying Your Car If It’s Wet – The car wash dries your vehicle in the same way a leaf blower does. Drying it is necessary because you don’t want streaks on your windows, plus a wet car will pick up more dirt. If you wash your car in your driveway finish it off with a blower. Cleaning Other Power Tools – Once you’ve finished cutting your grass the lawn mower will be a mess. You’ll need to give it a good clean if you want to look after it properly. Blast it with your blower to get rid of any grass and it will be spotless in a few seconds. Keeping The Dryer Vent Clean – If your dryer vent is covered in lint it’s very dangerous. There is a chance it will catch fire, so you have to keep it clean at all times. It’s quick and easy to remove any unwanted lint and other debris with a leaf blower. Getting Rid Of Light Snow – Hopefully you have a heavy-duty snow blower in your garage, but it’s sometimes a waste of time bringing it out. When the snow is pretty light a leaf blower will be able to handle things before it turns into ice. You Need To Lay A Tarp On The Ground – Before you even think about switching your leaf blower on you’ll need to lay a tarp on the ground. It’s pointless blowing leaves into a pile without one. If there is no tarp you’ll be forced to bag your leaves by hand. Instead, it’s much easier to drag a tarp to your mulch bin and dump them in. Make sure the pile isn’t too big if the leaves are wet. Moving Around In The Right Direction – You have to come up with a plan of attack, which you’ll only need to do once. It’s good if you start in one corner of your garden and keep moving around until you end up in the middle. If you don’t follow this approach you could give yourself more work to do by blowing leaves where you’ve already cleaned up. Use the same route every time you go outside and you’ll keep getting quicker. Always Focus On The Bigger Picture – We’ve just talked about finishing quicker every time you go outside, which isn’t going to happen if you’re a perfectionist. Don’t attempt to collect every single leaf. If you get the majority of them you’ll be doing fine. Anything more and it will obviously slow you down. Once you’re finished in the middle of the garden grab any leftovers with a rake. Should I Set Up A Mulch Bin Or Compost Bin? Gardeners will already know how to make compost, so if you don’t have a clue it’s easier setting up a mulch bin. This is because it’s extremely simple and your garden will still benefit from it. Compost takes up time long after you’ve cleared all the leaves. All you have to do to create mulch is dump leaves inside a bin and you’re done. You won’t even have to wait too long to use it. You’ll be able to stop weeds from growing in your garden, plus it will help your soil retain water to feed your plants. Locking Self-Watering Lid keeps animals out while openings allow air flow. How Many Days Can I Wait Before Clearing Up? Lots of people wonder how long they can wait until they begin tackling the leaves. This depends a lot on how many trees are in your garden, but on average it’s usually a good idea to wait no longer than 3-4 days at the most once your lawn is covered. If you wait any longer it’s going to smother your grass, which will cause you problems once the leaves and snow finally disappear. Under no circumstances can you wait until all the leaves have fallen off the trees. You’ll have to go out with your leaf blower more than once. CFM (Cubic Feet per Minute) – Let’s assume you buy a leaf blower and it has a rating of 400 CFM. It means for every minute the tool is switched on 400 cubic feet of air volume is exiting the nozzle. You’ll have a good idea how many leaves you’ll be able to handle. MPH (Miles Per Hour) – You’ll already know miles per hour is related to air speed. A rating of 150 MPH means air will leave the nozzle at 150 miles per hour. If the number is higher you’ll be able to take care of more stubborn leaves. If you look at some companies in the power tool industry you’ll notice they’ve been around for over a hundred years. Unfortunately, there has always been something missing until now. None of them focused their efforts purely on renewable energy. GreenWorks dedicated themselves to the eco-friendly movement, and they’ve seen a sharp rise in fame over the last few years all around the world. They have facilities scattered across the globe offering customers smarter, greener, and cleaner solutions. 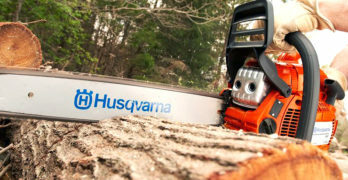 Thanks to their focus on green power tools they’ve been able to catch up with massive companies in less than a decade. By 2020 they want to be one of the leaders in the industry, which seems reasonable once you’ve used any of their amazing products. 80V battery makes this the equivalent of a 32cc gas leaf blower. ✓ View or download the MANUAL for the GreenWorks Pro 80V Blower. It seems weird relying on a battery to power tools, so you’ll obviously be wondering how long it will last. Even if you hold the trigger non-stop it’s going to give you around 70 minutes of runtime per charge. This will be long enough for most people, but what if it’s not? When you charge the GreenWorks Pro GBL80300 it will only take 30 minutes until it’s full. Buy a spare battery and you’ll never have to wait again. Streamlined design makes it easy to use for long work periods. The GreenWorks 80V blower is meant to be the equivalent of gas models with a 32cc engine, which makes sense when you see the stats. DigiPro brushless motors definitely offer a powerful performance. An air speed of 125 MPH is the same as an F2 category tornado. The rating of 500 CFM is equally impressive. It will be strong enough to clean up wet leaves and debris, so you won’t need to wait until everything is dry. If you live in a regular home you’ll have neighbors, which means a quiet leaf blower is always recommended. The GreenWorks Pro 80V GBL80300 measures in at only 60 decibels when at full speed. The decibel level won’t mean anything to you on its own, so we’ll have to compare it to something else. It’s about the same as listening to a conversation. This won’t be loud enough to damage your hearing. Anyone who owns gas power tools will know how awkward it is trying to pull a cord. Thankfully, you’ll be able to start the GreenWorks 80V blower by pressing a button once you’re in the garden. The motor will take a while getting up to speed, but this will only be a couple of seconds. If you’re not trying to reach full speed it will be even quicker. Once you release the trigger it will stop automatically. The last thing you need when you’re clearing leaves is a heavy blower. It would be a huge challenge to hold it for 70 minutes without taking breaks. You’ll hardly notice you’re holding the GreenWorks 80V blower. It only weighs 8.2 pounds, which is almost nothing. It’s the same weight as a gallon of milk. If that’s still a challenge for anyone they’ll be able to swap hands until all the leaves are gone. It’s not just the weight you need to be concerned about. Any power tool blasting air out at 125 miles per hour is going to vibrate. The only question you need to ask is how much it will affect you. All battery-powered leaf blowers are designed to vibrate as little as possible and the GBL80300 is no different. Your arms will never feel exhausted due to vibrations no matter how long you hold it for. The DigiPro digitally controlled brushless motor won’t just offer you power. It’s very reliable and won’t break down. The 80V lithium-ion battery uses the highest quality Panasonic cells so it lasts a long time too. In other words, it’s been engineered to last the distance without breaking down. This means you won’t have to perform any maintenance work on it. When you need to clear up leaves it will be ready to go. Compare the GreenWorks 80V vs 40V Battery. Which one? If you’re buying a leaf blower it’s likely you’ll be looking for other power tools too. Stick with GreenWorks Pro 80V tools and you’ll save lots of money. You won’t need to buy any extra batteries in the future. The one inside your GreenWorks 80V blower will work in them all. You’ll have access to a hedge trimmer, 18 inch chainsaw, lawn mower, and string trimmer. They’re all as good as the GBL80300 leaf blower. Most of the power tools in your garage won’t be aesthetically pleasing, but we all know looks still matter. It’s one of the main reasons why Apple will continue to keep growing year after year. The GreenWorks Pro blower looks absolutely magnificent and very modern. It’s a sleek black color with a hint of luminous green. The simplistic design goes well with the colors. The GreenWorks Pro 80V blower (GBL80300) doesn’t cost a lot of money, but a few people might feel uneasy buying one. After all, even though the company is popular it’s not been around for as long as some competitors. 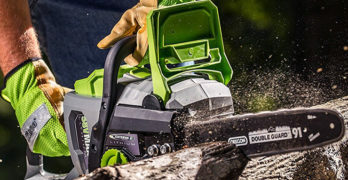 GreenWorks want to put your mind at ease, so they’ll give you a long 4-year warranty on the tool itself. The battery only comes with a 1-year warranty, but if you have extra tools you’ll use it more often. Learn more by visiting the GreenWorks site. They offer a lot of value and quality with all of their products, which makes it easy to recommend to our readers. 40V Battery-Powered Leaf Blower. A fantastic portable blower that you’ll instantly fall in love with once you get it in your hands. Cruise control allows user to easily set the blower at the optimum RPM. ✓ To learn more about this 40V Husqvarna leaf blower read our indepth review which will fill you in on all of the details. Ultimately, budget has a lot to do with the blower that’s right for you. We don’t all need the best and most expensive model, which is why we feel it’s important to consider other models. Ideal for clearing leaves and lawn debris around your home. *Maximum initial battery voltage (measured without a workload) is 60V. Nominal voltage is 54V. When you need to clear lots of leaves in a short amount of time a high CFM rating is crucial. BLACK+DECKER designed an axial fan capable of giving you 400 CFM, which is powerful enough for any garden. An air speed of around 100 MPH is great too, so it doesn’t need to be dry when you decide to clean up leaves. If we compare it to tornados again it would still be fast enough to reach F1 status. Obviously the GreenWorks 80V blower battery is a lot better, but one inside the BLACK+DECKER LSW60C is perfectly acceptable. If you’re working at full speed it’s going to last around 10 minutes before it runs out. When used at a regular speed on dry leaves it will last for around 30 minutes. I don’t know how many leaves fall from your trees, but if you need to stay outside any longer you must live near a forest. The BLACK+DECKER 60V blower only weighs 9.7 pounds, which would still be considered lightweight. It’s spread out to ensure the cordless leaf blower balances nicely when you’re holding it. Those two factors alone make it comfortable to hold, but the LSW60C takes it up a level. The ergonomic handle is a pleasure to grab and it’s easy to squeeze the trigger while you’re working. Sometimes leaves won’t want to go anywhere no matter how much air you blast them with. It’s usually because they’re stuck to the ground, so you’ll appreciate the metal scraper on the nozzle. If anything doesn’t want to move you can scrape it until it’s loose enough to blow away. Lots of people usually attempt this without a metal scrapper and end up damaging the tip of their leaf blower. There will be times when you’ll start working even if you’ve forgot to charge your battery beforehand. You don’t want your leaf blower to run out after a few minutes because there isn’t enough juice. That won’t be a problem if you’re using an LSW60C blower. It has a built-in state of charge indicator telling you exactly how much power is left. This feature can motivate you to speed up when you’re working. We’ve already said the BLACK+DECKER LSW60C won’t last long when it’s running at full speed. It’s because you’ll have access to a lot more power if you come across leaves too stubborn to budge without an extra push. If you want to take care of them hit the POWERBOOST button sitting on the top of the handle. It’s still worth cleaning more often to prevent a buildup of heavy debris in the first place. Read our full, dedicated review of the best BLACK+DECKER leaf blowers, or visit the Black + Decker site to learn more about their full range of tools and power equipment. Can run for up to 1 hour on low setting. Consider a 2nd battery. EGO said their turbine fan engineering was inspired by advanced aeronautics technology. It’s resulted in them being able to create a very powerful leaf blower that will rival many gas-powered models. When it’s set to the highest speed you’ll get a rating of 480 CFM. The air speed tops out at 92 miles per hour, which probably has to do with the nozzle head being wider than models with higher speeds. Extra boost gives you power on-demand. The EGO Power+ 56V blower has a high rating of 480 CFM, but that’s only when it’s set to turbo boost. In total, you’ll have 3 speeds you can switch between depending on the condition of your garden. You’ll also be able to choose between high efficiency mode and high power mode. High efficiency has a rating of 250 CFM and high power sits at 385 CFM. The runtime will depend on which one you use. You have the option of buying an ECO Power+ leaf blower with a battery, but the LB4800 model doesn’t come with one. I’m sure you’ll want to know the difference between both batteries available to you. The 56V 2.0Ah battery has a 60 minute runtime on the lowest speed, or if you’d like a longer runtime the 56V 2.5Ah battery lasts 75 minutes. There isn’t a great deal of difference between them. When we looked at the GreenWorks 80V blower earlier on it had a rating of 60 decibels, which was extremely low. The ECO Power+ LB4800 is almost as quiet because it will only hit 65 decibels. It means the LB4800 is still as quiet as a conversation, but it’s way up at the high end. You should be able to use your leaf blower whenever you want without fearing the wrath of your neighbors. You won’t find many leaves on the ground in winter, but the weather isn’t going to be great even in autumn. Any leaf blower you buy should be able to handle bad weather conditions. Weather resistant construction helps the Power+ LB4800 blower handle all sorts of weather. It’s durable enough to take a few bumps too, although it only weighs 5.1 pounds so you’re unlikely to drop it. Open up the ECO Power+ LB4800 leaf blower and you’ll find a highly efficient brushless motor inside, which gives it lots of advantages. The biggest one is probably how many years it will last without any problems. It’s comfortable to hold because it hardly vibrates even when switched to full speed. The brushless motor also has a positive impact on its overall weight, maximum runtime, and compact design. One of the most popular blowers you can buy — and for good reason. The DEWALT DCBL720P1 might only have a 20V Max lithium-ion battery, but it’s still going to perform well. With a rating of 400 CFM it holds its own against more expensive leaf blowers we’re discussing. It has a maximum air speed of 90 MPH, which will move heavy debris if you’re close enough to it. 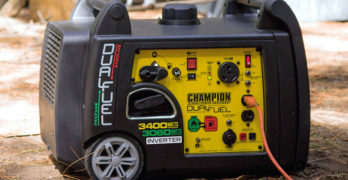 The blower will have a long runtime when you’re working at max power because it has a 5Ah battery. Professional build quality makes this a durable tool. If you only have a specific number of speeds you don’t have as much freedom. There are times when the lowest setting might be too high. A variable speed trigger will let you choose exactly how much power you need. After a few minutes you’ll learn to love the speed lock too. Trying to hold a trigger in the same position for a long time is exhausting. Turn the lock on when you’re happy with the power and you can let go. Leaf blowers usually look more intimidating than they actually are due to their length. The DCBL720P1 measures in at 15.2 x 7.8 x 23.4 inches. You’ll discover they’re actually very simplistic power tools. You can switch this one on by pulling the trigger, plus it will stop just as easily when the lock isn’t on. If you do have the lock on it will still only take you a second or two to power down. In their quest to give you unbelievable performance for a cheap price DEWALT came up with an innovative axial fan design. The back of this model looks like something you’d see on a jet engine. It maximizes the air output giving you higher CFM and MPH ratings than you would expect to see. The axial fan design has an impact on the run-time too, so you’ll be able to work for longer before recharging the battery. Pay attention to where they’ve positioned the battery. It sits underneath the trigger to help with balance. This will give you a lot more control when you’re working and the leaves won’t blow everywhere. It’s also going to minimize stress on your arms to prevent any injuries. You’ll be able to keep working for longer too. Even once you’ve attach the battery it will weigh a total of 9.7 pounds. Perfect for your workshop, garage or yard. Now you know your arms will be protected, but what about your ears? You’ll have nothing to worry about as far as your hearing is concerned, because at maximum power the DCBL720P1 has a low noise rating of 61 decibels. When your leaf blower is quiet it’s going to help with safety too. You never know when someone is going to walk past you when you’re outside. If you can hear them coming they won’t be blasted with leaves and other debris. Dewalt tools are very well-built. A wise investment. The DEWALT DCBL770X1 has a high efficiency brushless motor tucked inside it, which will last a very long time before running into any difficulties. It has an effect on the maximum runtime too. When you combine the motor with a 60V Max 3Ah battery it will keep going until you’ve cleared the leaves from your garden. If you need to tackle a bigger area you can keep a spare on the charger. Industrial build-quality. You get what you pay for. The CFM and MPH ratings on the DEWALT DCBL770X1 60V blower is where it really shines. If you’re using the tool with a round nozzle you’ll end up with an air volume of 423 CFM and air speed of 129 MPH. The tool comes with a flat concentrator nozzle you can use to switch things up. Once it’s attached you’ll have a maximum air volume of 287 CFM, but the air speed will jump up to 175 miles per hour. Don’t be scared by the noise rating even though it looks a bit high. It’s still much lower than you’ll find on most other leaf blowers. When you’re running at full speed it will reach up to 67 decibels. You have to remember the top speed puts it in the same bracket as an F4 category tornado. It might be louder than a conversation, but it’s quieter than an alarm clock. Your hearing will be fine and your neighbors won’t hate you. When you walk onto worksites around the country you’ll see DEWALT power tools everywhere. Part of the reason why they’re trusted by professionals is because they are durable. The DCBL770X1 will be able to take a beating. Just because you’re working at home it doesn’t mean you don’t want a leaf blower designed to withstand heavy-duty usage. It also comes with a nice frame so you can lay it on the ground safely. Leaf blowers are great because you can use them throughout the year for lots of things, but you’ll still need to store them away. It helps when they’re as small as possible like the DEWALT DCBL770X1. It’s only 10 x 18 x 15 inches in size even though it’s so powerful. The reason it’s shorter than most blowers is because of the unique design. It only weighs 9.8 pounds and is easy to carry around. The DEWALT DCBL770X1 is similar to the GreenWorks 80V blower, because you’ll be able to use the battery in every Flexvolt tool. There is probably one big difference between the two brands. DEWALT is a much larger company with many more power tools available in their lineup. If you have a couple of 60V batteries you’ll be able to use them in tools so powerful they need 120V to work. Visit the Dewalt site to see their full line of leaf blowers or visit Amazon to have one delivered straight to your door. Pay Close Attention To Windows And Doors – Models like the GreenWorks 80V blower are quiet, so you’ll hear people and cars coming towards you. Don’t forget to keep your eyes peeled for open windows and doors, because you could throw lots of debris inside. Dampen Any Dusty Areas Before You Start – You don’t have to soak the ground thoroughly, but make sure dusty areas aren’t bone dry. If they are when you switch the leaf blower on you’ll end up endangering your health by ingesting lots of dust. Don’t Use It To Clean Up Things Like Gravel – If you accidentally hit someone with leaves they would be okay, but blasting little stones around everywhere isn’t a good idea. They could also end up chipping your windows and car paint. Please Note: If you want a full list of safety tips please read the instruction manual once you’ve bought your leaf blower. The GreenWorks 80V blower will definitely be able to take care of all your needs. Clearing the leaves from your garden will never be a problem again. You might be finding it hard to decide which one you want because the other models are amazing too. You should take a few minutes to read some of the reviews on Amazon. Customers left them to help make your decision a hundred times easier. It shouldn’t take you long to choose your favorite model once you’ve taken the reviews into consideration.